First make your pizza dough. Place the flour and salt in a large bowl and make a well in the middle. Mix your yeast and sugar with the lukewarm water and pour into the well. Using a fork slowly make circular movements, bringing the the flour from the inner edge of the wall into the water. Continue to mix bringing in all the flour. The dough will start to come together now and become hard to mix, using your hands begin to pat into a ball. Knead your dough for 10 minutes by rolling it backwards and forwards. Using your left hand to stretch the dough towards you and your right hand to push the dough away from you at the same time. You should now have a smooth, springy dough. Put the dough in a oiled bowl and cover with cling film, then leave to prove for 1 hour. Halfway through the prove, preheat your oven as hot as you can. Place a baking or pizza tray in there to heat up. Once the hour is up, cut your dough in half. You can freeze one half for next time. Dust your work surface with a little flour and roll out to the shape of your choice. Now it's time for the sauce. Heat a little oil in a saucepan a low to medium heat. Add your crushed garlic into pan and cook for a few minutes. Then add the crème fresh and give it a good stir. Stir in the tomato puree and add the saffron, paprika and oregano. Season with salt and pepper. Cook for a further few minutes. Turn off the heat and spread the sauce evenly over the pizza base. Place on the mozzarella, chicken, chorizo, red pepper and onion. Remove the hot baking tray from the oven and carefully transfer the pizza onto it. Cook for 8 minutes. While your pizza is cooking, boil the peas to the instructions on the packet and cook your squid in a frying pan for a few minutes with a little salt and pepper until cooked. 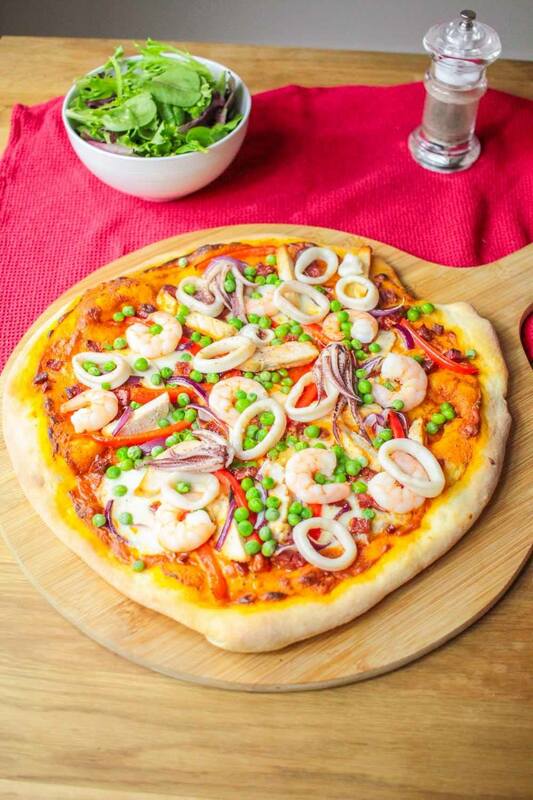 After 8 minutes, check your pizza and add the prawns, squid and peas. Then cook for a further 2 minutes or until your dough around the crusts is golden.